The Division of Student Life supports and complements the primary learning mission of the College to ensure “graduates possess the knowledge and skills necessary to become informed and successful participants in the global community.” A key component in ensuring our students develop into successful community participants involves exposing them to opportunities to serve others. Serving others allows our students to demonstrate choices and behaviors which promote social responsibility, value diversity, and apply appropriate perspectives in recognizing and changing communities locally and globally. The Campus Activities Board hosted a Giving BINGO to stock the shelves at Caz Cares. Students who brought a canned item to BINGO received an extra BINGO card. The event helped complete our Thanksgiving Basket project and provided several boxes of canned goods for Caz Cares. The College community, including several student organizations, donated all the items (turkey, vegetables, rolls and pies) needed to fill 11 complete Thanksgiving Baskets for families in need. 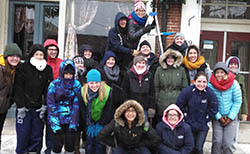 Members of the Student Government Association, Alpha Phi Omega Petitioning Group (service organization) and Sigma Alpha Pi (leadership organization) assisted the Cazenovia Garden Club with Garland Hanging along Albany Street in the village of Cazenovia. Students in the Leadership Development Community spent an afternoon playing BINGO and Trivia with the residents at Crouse Community Center. Members of Sigma Alpha Pi and Alpha Phi Omega sponsored a Mitten Mania campaign to collect hats and mittens for children in the community. The Human Services Club, Equine Ambassadors Club and Student Government Association participated in Adopt A Family for the holidays. Gifts were provided to all family members, along with stockings for the children. Students wrapped-up a full semester of service, providing meals every Monday night at Friendship Inn. From our students and the entire Cazenovia College campus family … we wish you and yours a wonderful holiday season and a healthy and peaceful New Year.